Ever noticed how your blood pressure escalates when you let a driver into your lane and they don’t even acknowledge your existence? Or when you hold the door open for what seems like 50 people… and they all breeze by as though you’re a garden statue? How about when you spend a small fortune at a retail store, and they hussle you out the door without so much as a “glad you stopped in”? What is the ONE THING that would have turned these situations from aggravating to satisfying? It’s amazing what a smile, a nod of thanks, or a “we appreciate your business” can do to your perception of an experience or, for you business owners out there, to your clients’ perception of your business. Think about it for a moment. What do YOU do to thank your clients for CHOOSING to buy your product or use your service? Sincere gratitude is a door opener. An appreciative client is more likely to refer future business your way, than one who feels like a nameless face with a wallet. 1) Just Say It! – If it’s sincere, it can truly be as simple as that. 2) The Follow Up Thank You Note – An email, a handwritten note, or even a Facebook message will let clients know they’re appreciated, AND keep you top of mind for when their friend just happens to need that widget you produce or that service you provide. 3) The Hug – This one has to be used with some delicacy, as everyone has a different degree of personal space comfort. However, I can personally remember every meeting that has ended with a genuine hug. Those people and their businesses have been positively ingrained in my memory, and it’s easy to remember to refer someone who made such a personable impression. 4) The Customized Promotion – Sending a “You bought this widget, so now you need this add-on widget” promotion is impersonal at best. In conversations with clients, you’ll get clues about what they personally like and need. When you send your thank you promotion, show off the fact that you were listening. Customize it. That kind of impressive follow-up is something they’ll write home about! What’s the most creative “thank you” you’ve ever received from a business? How do you personally thank your own clients? 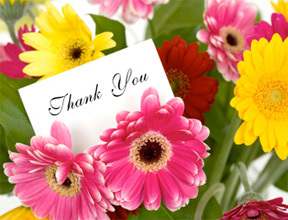 And to all of my new and regular readers, thank you for your continued support and loyalty. I couldn’t successfully do what I do without you! Want to get creative with your “thank you”s? I can help you design a customer appreciation system that’s as unique as your business! Email me any time for more information – dawn@dmtartistry.com.